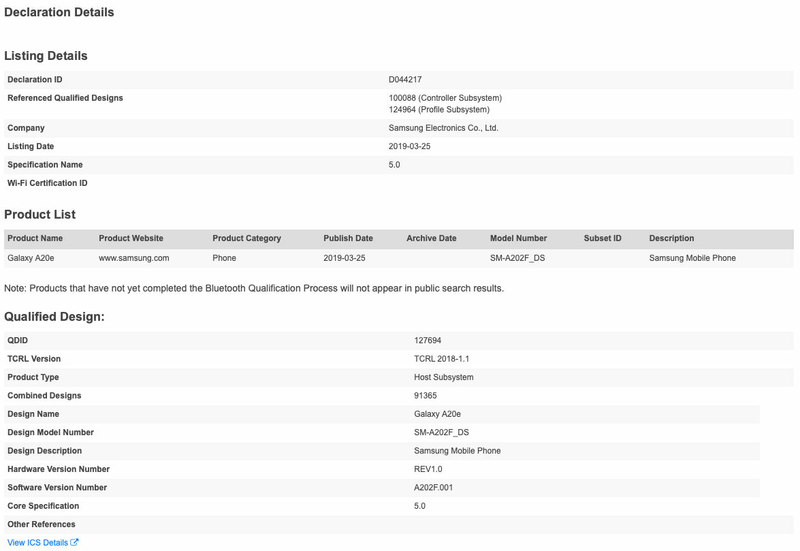 There haven’t been many leaks or rumours on the Galaxy A20e, but the device has popped up several certification websites. 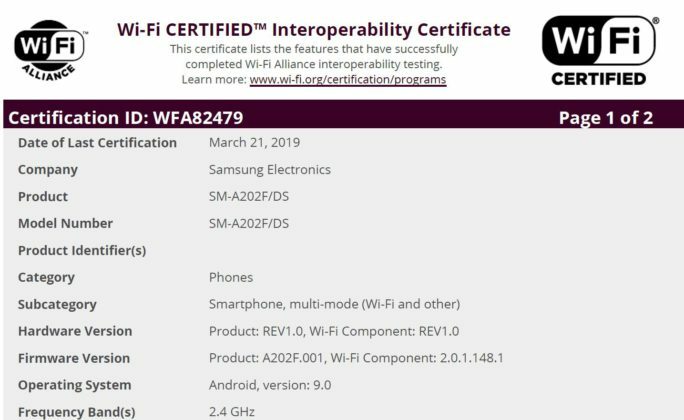 Now, the Samsung phone has been certified by the Wi-Fi Alliance and Bluetooth SIG. These certifications confirm the ‘e’ moniker for the phone, but we still don’t know much in terms of the specifications for this device. The phone had also appeared on the Samsung UK website very briefly, before being taken down. However, there are chances that the phone will be very similar to the recently announced Galaxy A20, which is also powered by the Exynos 7884 SoC. The standard A20 features a 6.4-inch Super AMOLED display with a V-shaped notch and HD+ resolution. It is the latest budget smartphone from Samsung and was recently launched in Russia. The phone gets a dual-rear camera setup with a 13-megapixel main camera and a 5-megapixel depth sensor. An 8-megapixel sensor is available for selfies and the phone is backed by a large 4,000mAh battery. We can, therefore, expect the Galaxy A20e to have similar specifications but with a few downgrades. The phone could feature a single rear camera instead of two and perhaps a smaller capacity battery. Samsung may also include a smaller display and get rid of the fingerprint scanner to cut down on costs. The Galaxy A20e could be a low-budget device and should be announced alongside the Galaxy A90. The South Korean giant has scheduled a new event for April 10th, where we expect it to announce the Galaxy A90 with pop-up camera and the Galaxy A60.